Today I wanted to share briefly my experience with using medication for OCD. For those who have been around awhile and/or read my book, some of this may sound familiar. 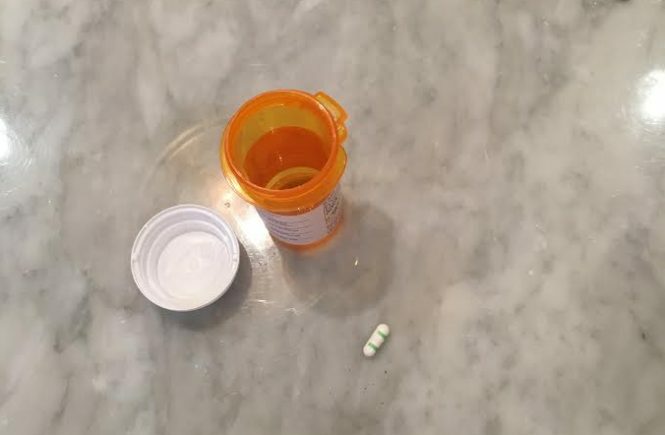 Mostly, I want to address some common fears or questions that people might have about taking medication for a mental health condition like OCD. When I first had OCD symptoms surrounding primarily moral scrupulosity, I wasn’t quite sure what was wrong or what steps to take. I did, however, end up going to see a doctor and was prescribed fluoxetine (generic Prozac). I did fairly well on the fluoxetine, though the OCD didn’t “go away.” It was manageable, though, and I could live with it fairly easily, despite not knowing about or having been through any cognitive behavior therapy. I went off medication after a few years and things were okay for awhile. My OCD wasn’t super intense—at least it didn’t constantly interfere with my life. After a bit, though, things started to change. I was getting more angry and impatient with the habits of my children. I was worried about contamination and spreading sicknesses. Moral scrupulosity concerns returned. Hit and run OCD began. Etc. Etc. I tried what psychologists would call “maladaptive coping strategies” to handle my OCD, not really understanding that those don’t actually help. I avoided. I used hand sanitizer. I sought reassurance. I went to medial doctors. I did end up having a medical condition (endometriosis), but my OCD still remained, eventually fighting back with severe bodily fluid contamination that brought me to the decision to see a psychologist. I was going to try to work through my OCD with just therapy, but then I took a bad turn when my husband went out of town on a business trip. My psychologist at the time recommended I try medication again. I went to a doctor, got back on fluoxetine, and hoped it would work. Things definitely got worse before they got better. I had severe depression while getting back on the fluoxetine that time. I didn’t want to live anymore. I wanted to go to sleep and not wake up. Dying felt easier than living with OCD. I went to my psychologist after a few weeks of this, and he was of course concerned and recommended that I up my dosage of fluoxetine. I returned to my doctor, told him what was going on, and my dosage was doubled. After a little bit, things started settling down in my head. Again, the OCD wasn’t gone, but it was manageable. The fears weren’t looming so large. I could handle doing exposures or restricting myself from doing certain compulsions. I was able to do therapy. In fact, I did therapy and worked for months until I was pretty stable. My psychologist at that time recommended that maybe I wean off my medication. I did, imagining that since I had the CBT knowledge and experience, I would be able to “naturally” defy the OCD and live my life normally. It worked okay for a few months. But then the OCD began to get stronger, the obsessions came back or intensified, and I once again was becoming debilitated by the mental illness. Unfortunately, this time I was hesitant to go back on medication. I had just written my book and felt like I would be an impostor to have to “go back” on meds when I had just written about how great CBT is and how you just need to have willpower and work through your fears, live with your anxiety, and take back your life from the OCD. I felt like I was a failure. I felt like I “should” be able to manage on my own. Stubbornly, I refused to get back on medication. I went back to therapy, but I was still freaking out. My life was spiraling out of my control. One Sunday, a friend took me to the ER to get some immediate help for my anxiety. The next day, I went to the doctor and was put on Effexor/venlafaxine. I didn’t love this medication. Reading about it online scared me—I read about withdrawal being terrible and “brain zaps” if you missed a dose and wondered if this was really a good idea. I stayed on it for a little bit but eventually went to a different doctor and decided to go back on fluoxetine. I skipped one night’s dose of the venlafaxine, planning to start on the fluoxetine the next morning. I woke up with a massive headache but other than that escaped most other withdrawal symptoms. I went back on my fluoxetine and have leveled out mentally once again. My life is livable. I can do ERP without having a breakdown. I can live with the OCD. I am now a strong proponent of doing what you need to do for you when it comes to OCD and medication. If you need medication, take it! Don’t be ashamed! If you can manage without, great! We shouldn’t judge each other for whether or not we take medication to survive and live our lives. Some people get prescribed a drug but the dosage or specific drug might not work for them. If you are on a medication and aren’t feeling like it’s doing it’s job, talk to your doctor or psychologist! While the psychologist can’t prescribe or change your dose, he or she will likely know whether or not the dose is enough to tackle OCD. Don’t feel like you “have” to stay on a certain drug or dosage if you are uncomfortable or not finding relief. I wasn’t loving the effexor and decided to go back on a tried and true medication, and I’m so glad I did! Be your own advocate when you need to do so. Side effects can also be an issue for many people. I’ve noticed weight gain with fluoxetine, and of course the “cause” of that gain might be because I feel better and eat more or be more directly related to the medicine itself. I don’t know. But for me, I’ve accepted that being able to manage my life is worth a few more pounds. I also have been getting night sweats, etc. Medication is not without its side effects, of course, so you have to decide what trade-offs you are willing to take for your mental health. What is worth it to you? Should you get on meds? Overall, if you feel that your OCD or any other mental health condition is becoming too much and you feel like you can’t handle your life anymore, for goodness sakes, consider medication! Go to your doctor and talk about it! Don’t feel like you are hopeless or that if one medication didn’t work, all is lost. Get the help you need. We have such amazing resources today. Use them! What are you experiences with medication for mental illness? ← Does OCD Limit Us?